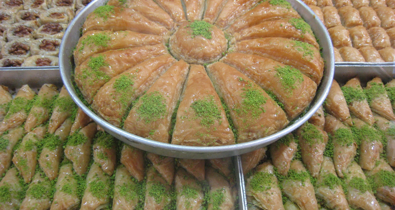 One of the world’s most famous Middle Eastern desserts, perhaps the most famous is baklava. Anyone who knows anything about the Middle Eastern cuisine knows baklava and is excited about it. With layers of buttery, flaky crust filled with a rich mixture of nuts, honey, cinnamon and sugar surely leaves an unforgettable memory in anyone’s mind. Being so famous, so international and so looked for, have also been a curse for this dessert, as every store remotely close to being Middle Eastern also tries to make and serve this item in their shops with limited success. After having looked for a better alternative for baklava and its derivations in New York for years, I was delighted to hear that a very reputable baklava and dessert company Güllüoğlu opened a branch right here in the heart of Brooklyn, New York. The store is not easy to get to for us living in Manhattan without cars. But it is still accessible on the B-D subway line. Fresh trays of various types of Middle Eastern desserts made daily in Turkey are brought into New York on plane, directly from Turkey. The retail location with a cafe inside is at 1985 Coney Island in Brooklyn with B subway line the closest. You can make it a day with a visit to the Coney Island historic neighborhood on a pleasant and sunny afternoon. They also serve an incredible su böreği (water pastry) served with a dark Turkish tea if you want to make your trip really worthwhile. We are pleased to report Güllüoğlu opened an elegant cafe in Manhattan this month. The cafe was booming with activity over the Ramadan holiday during which it opened its doors. It sells all varieties of middle eastern desserts for take out and eat in, in a pleasant setting. Great Turkish coffee and freshly brewed Turkish tea are also served along with a variety of Turkish savory and sweet pastries throughout the day. Living in New York just got a whole lot tastier! Cafe Güllüoğlu is located on Second Avenue and 52nd Street ın Manhattan, New York. Note that Gulluoglu also ships its baklava and other desserts. Send an e-mail with your order to gulluogluusa@gmail.com. Baklava is a very well known Middle Eastern dessert. Specialty stores that make these types of desserts offer a variety of choices including different fillings such as walnut, pistachio, or cream.